A black and white photograph of 575 Rossland Road East. The Whitby Municipal Building was built circa 1976. 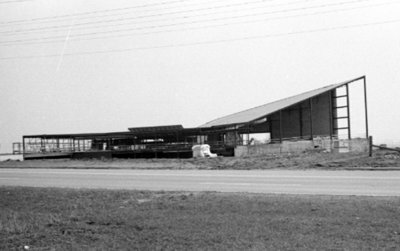 In 1977 the Municipal offices were moved from 405 Dundas Street West to the new building at 575 Rossland Road East. 575 Rossland Road East, April 1976, Brian Winter. Whitby Archives A2013_004_019B.